A drive across town running errands was a reminder of how creative approaches to information delivery can beat the traditional approaches. 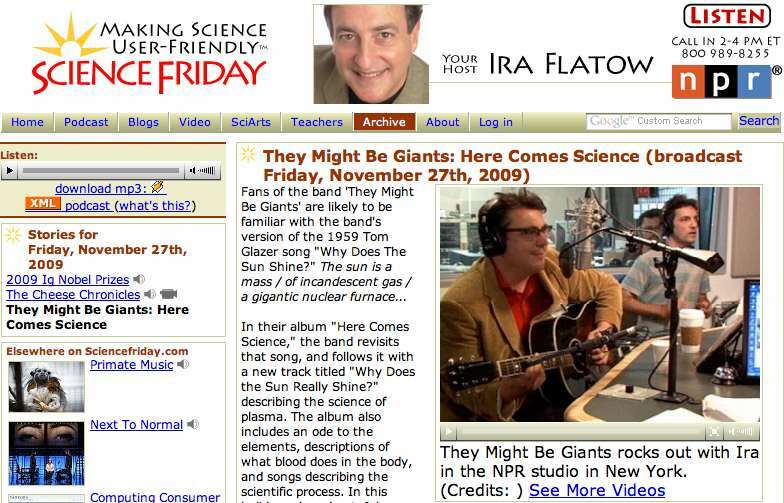 I happened to listen to Ira Flatow’s Science Friday on National Public Radio. He introduced They Might Be Giants, a music group who lauched into playing and singing “Science Is Real.” The song had toe-tapping lyrics about different fields of study in science — “anatomy to geology” — and walked through the steps of the scientific method. I think that I could be ready for a science quiz and would be able to hum the lyrics while answering the questions. I checked online and found the “Science Is Real” album, complete with songs like “The Bloodmobile” that explains how blood transfers food through the body. By taking the song stanza by stanza, you, as the history teacher, could get your students to investigate some of the key historical, policical and cultural events of recent history — and do so in a way that would engage the students. The faculty in the Journalism Department where I teach have been discussing how to have students with better grammar skills. We are working on a required grammar entrance test that would also provide a semester-long grammar review program for those who didn’t pass the test on the first (or second) attempt. Or maybe we should find out if Grammar Girl can sing.